Please complete these forms out promptly. They must be completed *at least 48 hours* prior to our first session. All of your personal information will remain strictly confidential. This will be emailed from Nutri-Q, not me. Please make sure to check your spam or junk box if you don’t see it in your inbox. You will first receive an email asking you to confirm your email address. Upon confirming your email address, you'll then receive an invitation email saying "Take An Online Questionnaire". 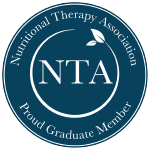 PLEASE LET ME KNOW AS SOON AS POSSIBLE if you don't receive the email confirmation request and/or the invitation email from Nutri-Q. (Please complete the online questionnaire at least 48 hours before our first session). If no, why, how, and when did you quit smoking? When did this change first occur? Were there complications associated with these births? Have you ever had a miscarriage or an abortion? Do you wake at night to urinate? Would you like to discuss men’s health issues specifically? Please provide any other information that you feel is relevant.